Former Boca youth standout Chris Konopka, a current member of the USL’s Jersey Falcons Premiere Development League team, was in goal Wednesday afternoon as the Falcons faced the Long Island Rough Riders with former Major League Soccer stars Giovanni Savarese and Jim Rooney in front of 3,019 fans in an afternoon contest at the Mitchell Athletic Complex on Long Island. UNIONDALE, L.I. 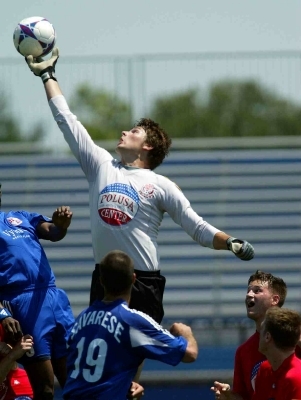 (July 7, 2004) – Former Jersey Shore Boca youth standout Chris Konopka, a current member of the USL’s Jersey Falcons Premiere Development League team, was in goal Wednesday afternoon as the Falcons faced the Long Island Rough Riders with former Major League Soccer stars Giovanni Savarese and Jim Rooney in front of 3,019 fans in an afternoon contest at the Mitchell Athletic Complex on Long Island. The game was a United Soccer Leagues cross-league encounter that pit the Pro Soccer League Riders (4-8-1) against the Falcons (1-12) of the Premier Development League. Former Jersey Shore Boca youth standout Chris Konopka skys for the ball to make a save for the Jersey Falcons of the Premiere Development League as they faced former MLS All-Star Giovanni Savarese (#19) and the Long Island Rough Riders on Wednesday afternoon at the Mitchell Complex in Uniondale. It also marked the first game this year for Giovanni Savarese, the all-time leading goal scorer for the Metrostars of Major League Soccer, who signed with the Long Island Rough Riders on July 3rd of this year after a nine-year outstanding domestic and international soccer career. The Rough Riders started pressuring the Falcons from the opening whistle, forcing a save from Konopka within the first two minutes. Against the run of play, Jersey had their first good scoring chance in the 10th minute when Scott Cahagan got in on the Long Island goal on a breakaway. Rough Riders goalkeeper Dan Sirota was able to make a sliding save to knock his shot away. The Rough Riders opened the scoring in the 12th minute of play. Stephen Franzke sent a cross from the left wing toward Savarese on the right side of the penalty area. Savarese had enough time and space to chest the ball down and slot home a shot from twelve yards out which the fully extended Konopka tipped but could not push beyond the far post. The Falcons had new hope when they were able to put together a series of passes for a counter-attack goal in the 35th minute. Jersey forward Scott Cohagan came in on goal from the left side of the 18 yard box. He sent a pass across the goal mouth for midfielder Phil Swenda to knock a shot past Sirota from only five yards out. The Falcons were forced to make a change in goal in the 39th minute as Marcin Czerwinski came in to replace Konopka, who injured his shoulder on a scuffle inside his penalty box a few minutes earlier. The Rough Riders scored once again before half-time and added two more in the second half to end the game 4-1 in their favor. Konopka, who enters his sophomore year at Providence College in September, made 3 saves while facing 4 shots before leaving the match. The 2003 Toms River East High School graduate made his seventh start of the season for the Falcons. He has logged 594 minutes in eight total games, made 58 saves and has allowed 15 goals in PDL action this year. Konopka is expected to return to action for the Falcons by next week. The Rough Riders visit the Falcons for a rematch at 5pm this Sunday in Jersey City. Konopka is a long-time youth member of the Jersey Shore Boca soccer club and was part of Boca’s 2003 Premiere Development League team and Boca’s Super Y-League teams in 2002 and 2001. The Toms River native has also been named to the roster of the U-19 US Soccer Regional Team three times during 2004 and has competed in 14 national and international games with the US Regional Team this year. The standout goalkeeper is a computer graphics and design major at Providence.